Use Compressor to customize encoding settings available in Final Cut Pro. Choose from a wide array of codecs, sizes, frame rates, and other parameters. Save your custom settings in Compressor; they automatically appear in Final Cut Pro. Share settings with other editors, even if Compressor isn’t installed on their workstations. Experiment freely with encoding options, using real-time feedback in the Preview window. Find exactly the setting you need in just a few clicks in the updated settings library. Set up batch processes to streamline the encoding of large numbers of files. Build batch templates to combine encoding with tasks such as moving or copying files. Create self-contained Droplets to encode on the desktop with drag-and-drop ease. Use one-step settings for Apple devices and websites such as Vimeo, YouTube, and Facebook. Work with a choice of themed menus to encode and burn a DVD or Blu-ray disc. Add chapter markers for discs or podcasts distributed on iPad, iPhone, iPod, or Apple TV. Encode to a broad range of industry-standard formats, such as MPEG-2, H.264, and ProRes. Generate files for HTTP live streaming in a single step. 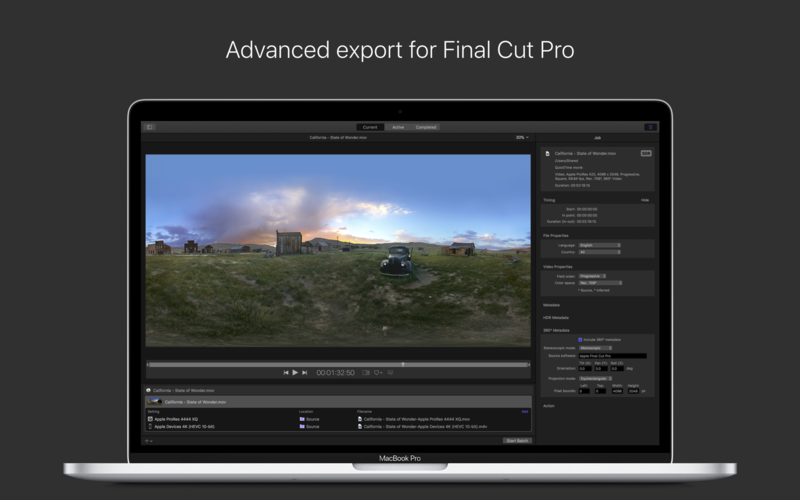 Import Targa, DPX, TIFF, PSD, or PNG image sequences and encode them to any setting. Tap into advanced encoding features for adding closed captioning, metadata, and more. Convert any file from its source format to another format, such as NTSC to PAL or SD to HD. Clean up and customize your content using image filters, a timecode overlay, and watermarks. Speed up video, slow it down, or adjust the frame rate to make the duration match a runtime. Save time by distributing encoding work among multiple cores and workstations. Install Compressor on any Mac to activate it as a cluster node for distributed encoding. Speed up encoding in Final Cut Pro by choosing a Compressor cluster for output processing. Activate QuickCluster for dynamic configuration of nodes based on available resources.